On the occasion of the Novruz holiday, leadership of the Ministry of Defense visited the Main Clinical Hospital of the Armed Forces. The leadership of the Ministry honored memory and laid flowers at a monument to national leader Heydar Aliyev erected in the territory of the hospital. Having met with the military personnel undergoing treatment at the hospital, Defense Minister, Colonel General Zakir Hasanov inquired about the health of the servicemen, presented gifts to them and wished them a speedy restoration to health and strength and a return to duty areas. Then the opening of a maternity department equipped with the modern equipment and devices based on latest technology and that is designed for medical care for family members of military personnel, as well as civilian and military female employees was held. 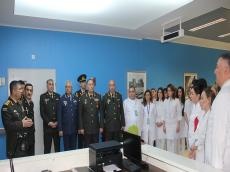 Having met with the medical staff, the Minister of Defense congratulated them on the holiday, wished them success and also gave appropriate instructions in connection with the provision of high professional services and care to all those who applied for medical assistance.